It is a simply beautiful idea for a linky. Due to a big problem with my Apple MacBook I still have not recovered all of my photos, so the earliest back in Winter I can go, photo wise, is 1st and 2nd November, but this is kind of apt, as it is the first time I can remember Aaron wearing a hat, scarf and jacket this Winter. He never agrees to wear a hat, unless it is freezing the balls of a brass monkey, but he did this day, simply because it was a novelty. Winter had begun. 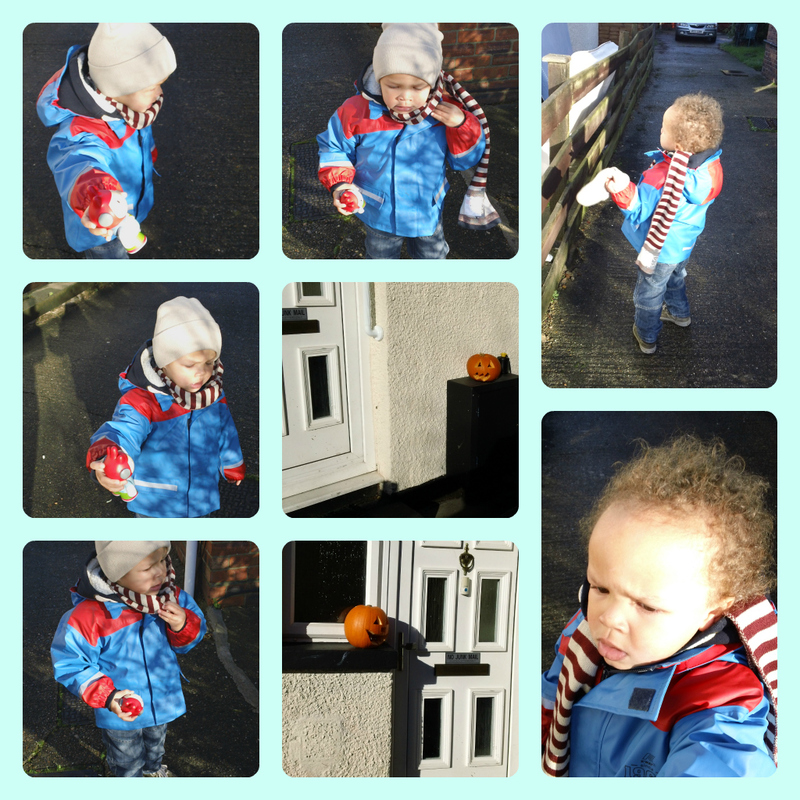 So 1st November saw Aaron in his hat, scarf and jacket. As you can see, the hat was soon off. This was me playing with my Sony Bloggie camera, a real novelty back then, and a snap at £35 from John Lewis. It takes fab photos and even better HD video footage that can even be played on a 46 inch TV. 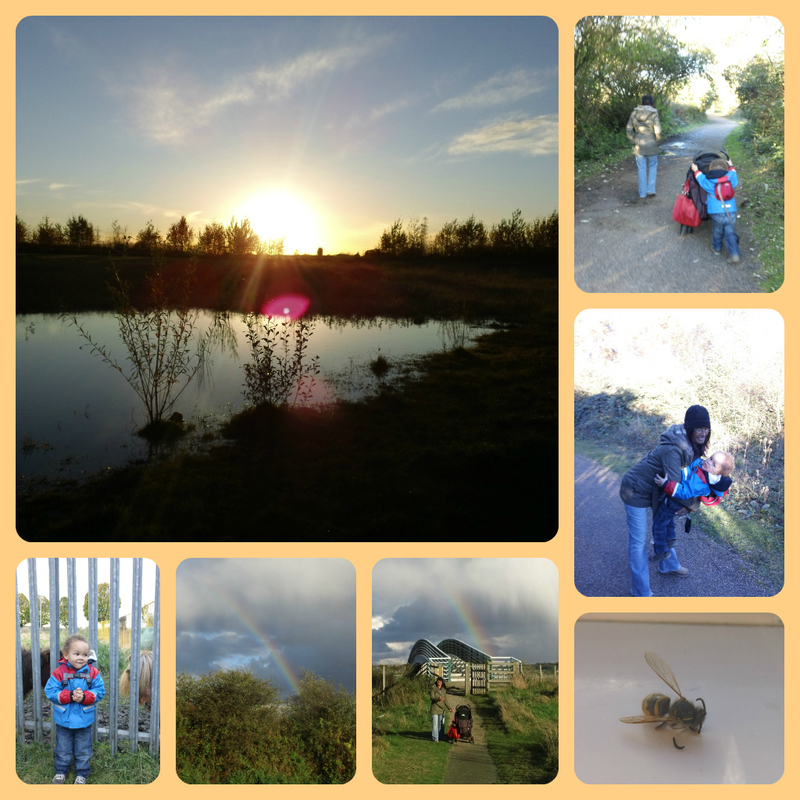 2nd November saw us go for a LONG walk with my friend Sandra. We saw beautiful scenes everywhere we went. Me and my new camera were very happy, and as you can see we were even blessed with a rainbow. In the pics you can see Aaron pushing the buggy. Even though it is slightly taller than him and he can't even see over the top of it, he has been obsessed with pushing it - on and off - all through winter. It took till last week for the husband to see him do it, and he panicked saying it was too heavy for him, but Aaron's been doing it for months and can even do it for half hour at a time. Just to prove that he knows what he can cope with, last week, (a week ago today) on the way back, the husband put three bags of shopping in it. Aaron pushed it only 3 feet and asked to go in it. He knew it was too heavy - he knows his limits. Is it true that bees die at the end of Summer? We found one, as above, and I took lots of close-up shots of it. In these 1st November photos below, you can see the pumpkins, left and right of our next door neighbour's door. No bigger indication is needed, that it was indeed November. Aaron loved looking at them, and called them "cumkins" no matter how many times we told him pumpkins. That is something I want to remember when he is older. 1st November was the ONLY day he let me put that scarf on him. He only wore gloves about 5 times despite us being out in the elements every day (I don't drive). Our local shops are a 30 minute walk, so it church, and we quite happily walk there often. Winter doesn't have to mean being wrapped up indoors; it can mean being wrapped up and active outside. Cute pics! I got DB to choose his hat and gloves and that certainly made it easier to get him to wear them. Lovely lovely pictures of your boy - I still class November as Winter, it can get very cold and dreary towards the end. So glad you are taking part! Cumkin - love it! X. Cumkins?! Brilliant. In our house cucumbers are called Pimbumbers. I love your rainbow shots, what a great capture. Sorry I am late commenting. I wasn't able to leave a comment when I first visited.